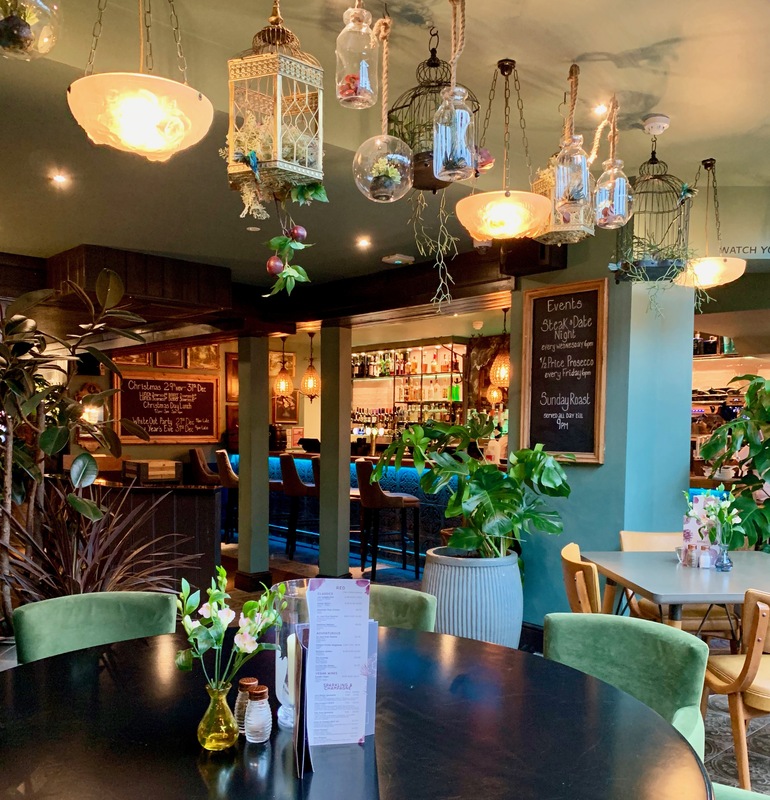 The Hummingbird is a brand new pub in my hometown of Hertford. Hubby and I both grew up in Hertford and it will always be a significant place for us. Although we’ve since moved away, it’s always nice to go back and visit so when I was invited to have lunch at The Hummingbird, I said yes straight away and asked my Mum to join me (she buys me a lot of lunches, I definitely owe her one!). You’ll find The Hummingbird on Fore Street, right in the town centre, in the building that used to house Loch Fyne. It’s an Aspley pub and has only been open for about a month, so it is very much the new kid on the block. However, for a new kid it is already doing pretty well – General Manager Jan told me that they have already taken 2000 bookings for the Christmas period. Not too shabby! The Hummingbird is lovely inside and you can tell that a lot of thought has gone into the design and look and feel of the pub. The first half of the space has more of a lounge feel, with comfy chairs and a fireplace, and is designed for more casual walk-in diners. On the right-hand side, there are some lovely booths which are quite intimate and perfect for a catch-up with friends. The bar is pretty fancy, with lights that change colour. The far end of the pub is the more formal dining area and is reserved for bookings only. You’ll find plush comfy seating, plump cushions, stylish decor and a friendly atmosphere – you could happily spend a couple of hours here! Upstairs, there is a private function room complete with honesty bar and TV. Mum ordered the prawn and mussel linguine, and I chose pan-fried sea bass fillet with mushroom risotto and tempura broccoli. We had to wait a little while for our food – it was quite a busy lunchtime. Mum and I didn’t mind though – we were warm and comfy and just had a chat. Our meals were both really good – very tasty, fresh and good sized portions. For dessert, we chose the lemon tart and chocolate brownie which were both delicious. Our meal came to £46 which included olives, two main meals, two desserts, and two drinks. I’m not used to having a big lunch and didn’t need to eat much at all for dinner! The Hummingbird is really lovely. It’s smart yet comfortable. I want to make a special mention of the staff because they were brilliant. So friendly and nothing was too much trouble. Launching a new pub in a town that is full of eateries is no mean feat yet GM Jan seems to be doing a fantastic job. Manager Xavio looked after us and made us feel very welcome. I would definitely recommend The Hummingbird for a long, lazy lunch or dinner. You won’t want to rush here. Take your time, enjoy the lovely surroundings and the tasty food. For more information, please visit The Hummingbird website. Disclaimer: Mums Off Duty received a complimentary lunch for two for the purpose of review. My reviews are always completely honest.